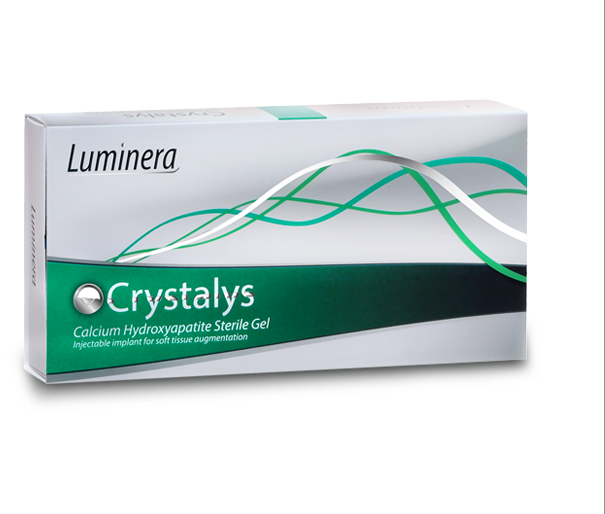 Crystalys contains 55% calcium hodroxyapatite microspheres. Crystalys is intended for deep and sub dermal tissue augmentation at the facial area. It is used for general restoration of the face and specifically for filling deep wrinkles and lines. As the dermal filler is injected, it lifts and adds volume to the injected area, thus getting immediate results. With time, the injected filler acts as a natural scaffold for endogenous collagen, enabling collagen growth. This process restores skin radiance, freshness and firmness and lasts for several months, therefore extending the initial effect for a long time, significantly more than hysluronic acid-based dermal fillers. Crystalys Dermal Fillers, based on natural components, is biodegradable and non-permanent. It is cleared from the body with no side effects, as the body recognises it as a part of its own. The treatment is safe, long lasting and naturally based. During the preliminary trials of the product, more than 1000 Crystalys syringes were injected with excellent safety and efficacy profile. The product is approved by the Israeli Ministry of Health and is CE Marked.